We ended up with another couple of inches of snow in Blacksburg this weekend. Unfortunately, they ended up with a couple of feet of it up in Baltimore, so my interview has to be rescheduled once again. Oh well. I spent most of the morning and afternoon catching up on some reading and working on my research project, which I think I actually made some considerable progress on. Anyway, I was getting a little bit of cabin fever around 4:00 and went out to take some pictures. I actually have a bunch from the last couple of days that will probably end up here eventually. 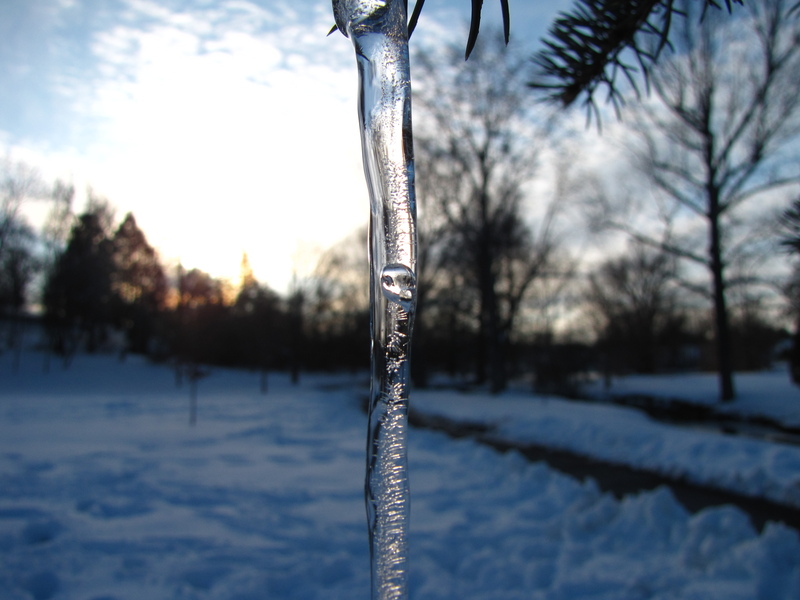 This icicle was hanging from one of the trees along the path out to the duckpond. 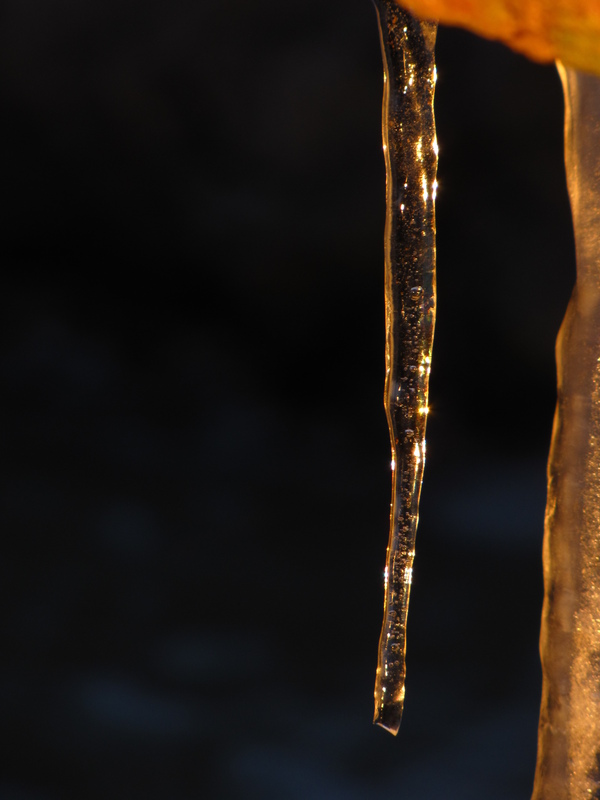 This was shot in “super macro” mode, with the icicle just barely away from the end of the camera. I really like the way this one turned out. The background, while blurry, is still fairly recognizable. All of the details of the icicle are also nice and clear, especially the bubbles trapped inside. I also think it’s kind of cool how shooting into the sun caused the left half of the sky to be blown out while the right half of the sky is exposed pretty nicely. It was completely unintentional, but the icicle makes a great division between these two. The image seen through the icicle also turned out nicely; it seems like you can make out one of the trees on the right side of the picture going up the left side of the icicle. This is another shot from the Horticulture gardens yesterday afternoon. If you look in the center of the picture, you can see the mass of icicles that last night’s picture came from. To the left of the icicles is the little waterfall from one of my pictures last year: A Frozen Shell. The color from the sun wasn’t quite as intense at this point, but it’s still nice. Luckily the sun was in just the right position in the sky to shine through the tunnel under the bridge and illuminate the rocks and ice on the other side. I really like the symmetry that the reflection in the water adds to this shot. The water is still enough to actually let you see a decent reflection, but has some ripples to show the water is moving. I actually took this with the legs of my Gorillapod down in the water in order to get closer to the surface. If you did not read my post from late last night, feel free to disregard the following. I spent a lot of time today thinking about what I wrote last night. And while I still stand by what I said there, I realized that I went a little far by actually posting some of that. Because of this, the latter portion of last night’s post has been removed. Like I said, I was in a weird mood last night, and didn’t think through my post as well as I usually do. The truth is that I have no way of knowing who is reading this, aside from those who leave comments. And while I have had some posts in the past that delve into some of my deeper thoughts, I have always tried to respect anonymity where it is appropriate. I know I didn’t mention any names, but I feel like I was much more direct than usual, and I felt a little uncomfortable about that over the course of the day. I needed to get that out of me in some form, but in retrospect, the blog was not the ideal medium. 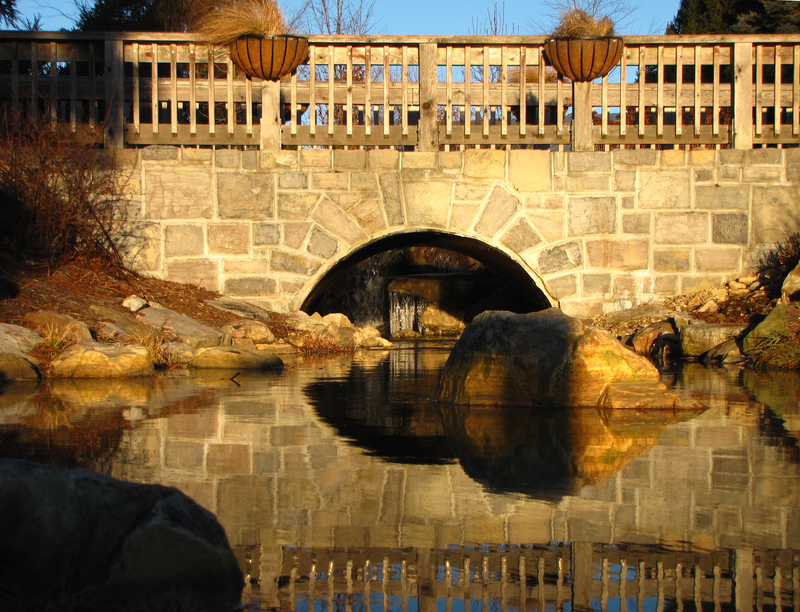 This one was taken late Wednesday afternoon up in the Hahn Horticulture gardens. Down by the little waterfall was a rock overhang that had a bunch of large icicles hanging from it. This one was much smaller and slightly off to the side. The bulk along the right edge is one of the massive ice blocks next to it. The color in this shot is completely natural, which blew my mind at first. I took this as the sun was really close to the horizon, casting an orange glow over everything. If you look closely enough, you can see little air bubbles trapped inside the ice.